The animal kingdom is full of rare and fascinating species. Among some of the most amazing underwater animals include the different types of cleaner shrimp. Perhaps the most interesting fact about this sea animal is that it can dance. It also clears parasites from other fish mouths. It enters into the mouth of a fish, gets a parasite and bounces out without the fear of getting gobbled up by a fish or eel! Like a number of other sea animals, the shrimp has a truly unique coloring. The orange color is evenly spread along its sides. A long red stripe, like a red ribbon is stretched on the dorsal side and is then bisected by a white almost narrow band. The shrimp has three thin yet long antennas on the head. On the tail are white tiny spots. Shrimps are classified as crustaceans. They belong to the Hippolytidae family, in the genus of Lysmata amboinensis. They come in a number of varieties that would interest an aquarist. The Lysmata amboinensis and Lysmata grabhami are the most common aquarium shrimps. They are also a strange variety as they literally clean most types of debris and parasites from fish. It is not unusual to find a large fish open up its mouth and a shrimp gets into it to eat away parasites stuck therein. For a first-timer, it may be scary as one imagines the shrimp will be gobbled up. Well, it gets even more interesting when fish come to the shrimp to be literally cleaned up. Popular belief is that the shrimp’s white and red strips protect it from predators in the form of other larger fish and eels. The truth however, is that the color is not protective enough. This shrimp obtained its name from a small hump found on its back, like that of a camel. A number of these Rhynchocienetes species are mostly found in tropical seas around the world. When harnessed in tanks, they easily become proficient cleaners, making them a very desirable lot. They are very attractive as they exhibit extremely vibrant colors. Their cherry-red colors with contrasting white stripes and dots make them quite attractive. 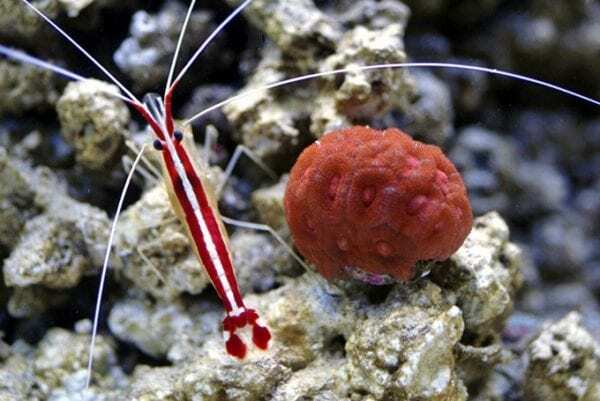 One great factor worth remembering is that different types of cleaner shrimp often eat coral reefs and may deplete a reef stock. With a lovely name, this rather shy yet mild tempered shrimp is not only delicate but sensitive as well. It likes to hide behind coral substrates or hard rock owing to its timid nature. At daytime, it rarely comes out from its hiding place, preferring to stay hidden under coral reefs. Mealtimes are usually during the night when they move in pairs. The female is slightly larger than the male. Like the rest of the cleaner shrimps, the harlequin has lovely colors too. The body is largely white with large black dots. Scientifically referred to as Lytmasa Debelius, this extremely beautiful shrimp is rather difficult to see owing to its nocturnal nature. It exhibits a bright red body with white speckles dominant on its head. It has a number of scarlet red legs that are easily distinguishable from the antennae that are long and white. It often hides behind coral especially if the tank is well lit most of the time. They love to feed on polyps and may be a poor choice for a shrimp lover. Its scientific name is Lysmata Wurdemanni. Originally from the Caribbean, this shrimp is quite reclusive. Once introduced into a tank, it enjoys staying out of sight, making it difficult to be seen. It feeds on small polyps and as a result, may destroy the mini-reef considerably. It also eats aiptasia anemones that may interfere with an aquarium. The peppermint shrimp may easily confuse one with its eastern pacific counterpart, Lysmata California. However, at normal reef temperatures, it may not survive for long. It is therefore necessary to check on this for an extended lifespan. In an aquarium, the Stenopus Hispidus is known to get along well with most kinds of fish. Yet it has enemies too! Trigger fish and eels love to feed on it. When presented with parasites, it actively cleans fish. Popularly known as Odontodactylus Scyllarus, this sea animal is very beautiful. They come in two hunting categories namely, smashers and spearers. Smashers are very forceful. With their club-like claws, they easily pulverize their hard shelled prey into a sumptuous meal. Snails are their most favorite clients. On the other hand, spearers silently claw their soft- tissued prey into meals. Their claws are spear-like. It has two long antennae found on its head. It has five long legs. Three of these are for walking and are called pareiopods. The other two are for swimming and are referred to as pleopods. They often set up a cleaning station where fish in need of cleaning come for sprucing up. The cleaner shrimp crawls on a fish body, clearing it of any debris and parasites. It even gets into its mouth without the fear of getting gobbled up. It feeds on algae and parasites. At times it feeds on snails and zooplanktons. A female shrimp may lay anywhere from 50,000 to one million eggs at one given moment. Baby shrimps, known as nauplii hatch out of eggs within 24 hours. They then feed on reserves of the yolk found on eggs that are not hatched. During the mating season, the shrimps eat their own. This is known as cannibalism. After fertilizing the eggs, the males feed on the females. Some shrimps are born with both male and female organs. They are referred to as hermaphrodites. This characteristic is common among the scarlet shrimps. Shrimps are mainly predated upon by lionfish, Moray eels, trigger fish and cat sharks. Young shrimps are hard to care for as they are difficult to feed. This often leads to a high mortality rate during their earlier stages. Despite the difficulty in breeding shrimps, they are sold at the market. The shrimp’s heart is believed to be in the head.